The business world is extremely competitive and some companies are willing to go that one step further and use surveillance devices to get ahead in their sector. How do you tell if you have been a victim of this approach to business? Read on to see the early signs that you may need a bug sweep UK wide service. Many of the early signs that you have been bugged by listening devices or hidden cameras are so small, they are often overlooked. It could as simple as the arrival of a new plant on your desk or in the corner of the conference room. Neither of these things attract much attention, particularly if greenery is an everyday part of your office environment. A slight change in the positions of several pieces of office furniture are another often overlooked sign that someone has been tampering with your environment and possibly planting devices in the space to spy on you. Changes in the routine of your maintenance company, cleaners or other outside contractors, particularly if accompanied by a reasonable excuse are not likely to raise any questions, but they should. If your maintenance provider suddenly wants to come outside of normal working hours, or someone turns up to service equipment when no service is due or has been booked, then there is a chance that their motives are anything but good. In these circumstances, you will want to seriously consider counter surveillance measures, including bug sweeping. Failure to take these signs of potential risk seriously could mean that the first you hear of the surveillance is when your rival overtakes your market leading position. If any of these early signs sound familiar, then you need the best possible bug sweep UK based company. At Advanced Sweeping, we will discuss your concerns in detail, determine your risk level and set about organising a sweep of your building whenever it is convenient for you. 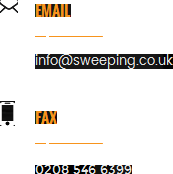 Check out http://sweeping.co.uk/ for more details of the services we provide.